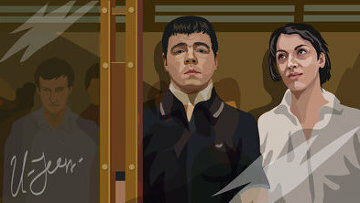 Russian lawyer’s murderers to appeal verdict | Russian Legal Information Agency (RAPSI). MOSCOW, May 6 – RAPSI. The defense lawyers of Nikita Tikhonov and Yevgeniya Khasis, who were sentenced today to life in prison and 18 years imprisonment, confirmed their plans to appeal the verdict. “I believe this sentence runs counter to the law, as there is no proof of guilt,” Gennady Nebritov, Khasis’ lawyer, said. Lawyer Sergey Markelov and Novaya Gazeta journalist Anastasia Baburova were shot dead in Moscow on Jan. 19, 2009. According to the investigation, Markelov was murdered for his active participation in an anti-fascist movement. Earlier, Investigative Committee spokesman Vladimir Markin said Baburova was shot dead as a witness of Markelov’s murder. The Moscow City Court passed a sentence on Tikhonov and Khasis today on the grounds of the jury’s guilty verdict. After the verdict was read, the defense said they will appeal the decision. Nebritov said there were “some defects” during the legal process. He noted that a jury member was forced to leave the panel as someone attempted to pressure her. 14:11 06/05/2011 The defense lawyers of Nikita Tikhonov and Yevgeniya Khasis, who were sentenced today to life in prison and 18 years imprisonment, confirmed their plans to appeal the verdict. 10:33 26/04/2019 A criminal case over the tragic fire in Zimnyaya Vishnya (Winter Cherry) mall in Russia’s city of Kemerovo that left 60 people dead reached the local Zavodsky court on Friday. 12:04 26/04/2019 Moscow’s Meshchansky District Court will pass sentence upon Viktor Zakharchenko, the father of the former Russian anti-corruption official Dmitry Zakharchenko charged with corruption crimes, on April 29.